Japanese Prime Minister Shinzo Abe is brushing away all calls to resign - and is trying to rally the nation behind his administration's support of coalition forces in Afghanistan. He vowed Monday to extend the mission. Abe, who on Sunday said he would stake his job on pushing the extension through, said Japan has a responsibility to continue supporting the coalition forces and added that he also will fight to keep an opposition emboldened by a big win elections in July from derailing his reform efforts. 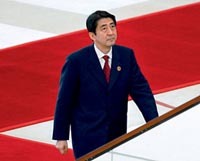 "Our fight against terrorism is continuing," Abe said in a speech opening a 62-day extraordinary session of parliament. "Self-defense forces working under the scorching sun of the Indian Ocean is exactly what the world expects as Japan's international contribution." Japan's navy has provided fuel for coalition warships in the Indian Ocean since November 2001 under a special anti-terrorism law, which has already been extended three times. The mission has been part of Tokyo's recent attempts to raise its international profile. Under former Prime Minister Junichiro Koizumi, who stepped down last year, Japan also sent non-combat troops to southern Iraq to assist in U.S.-led reconstruction efforts. The troops left Iraq in July 2006. The legislation expires in November. Abe is expected to be able to push the extension through, since his ruling Liberal Democratic Party controls the lower house, which has the final say on most legislation. But he is stumbling in public support. Public broadcaster NHK put his support rate at 34 percent in a Sept. 7-9 poll released late Monday, the latest survey to put him in the 30 percent range, well below the 70 percent he enjoyed when he took office. The Afghan support is not as big a concern with most voters - more than one-third of the NHK poll's 1,146 respondents said they had no opinion on the extension, while equal amounts opposed and favored it - as scandals in Abe's Cabinet. However, the issue has been shaping up to be a major showdown with the opposition, which has been strengthened by the July 29 elections and, led by the Democratic Party of Japan, now controls the upper house. Abe reshuffled the Cabinet in late August in a bid to regain voters' trust, but since then one minister has resigned over a money scandal. The latest resignation came after the departures of four other ministers since Abe's Cabinet was launched in September 2006. Three of them were replaced over money scandals, and one minister was forced to resign after a gaffe. It is unclear how soon the vote on the Afghan support mission would come. President Bush recently expressed hope Tokyo would extend the mission, but critics in Japan say such pro-U.S. operations violate Japan's pacifist constitution, which strictly limits the country's military activities. The Democratic Party's leader, Ichiro Ozawa, says Japan should only participate in U.N.-led peacekeeping missions. On Sunday, he said he would push to keep the Indian Ocean mission going, saying it is part of a pledge Japan has made to the rest of the world. He indicated that he would step down should the extension fail. "I would not cling to my job as prime minister," he said. "I have to make every effort to continue the fueling mission. He added, "I am prepared to ... put my job on the line so I can gain understanding from the opposition bloc." The remark, made in Sydney, where Abe was attending the Asia-Pacific Economic Cooperation forum, drew immediate criticism from the opposition that he should have already resigned immediately after the election defeat. "I am aware some are saying I should resign after the voters expressed severe opinions," Abe said Monday. "But I've decided to continue with my job as we cannot stop reforms for the future of our country and children."